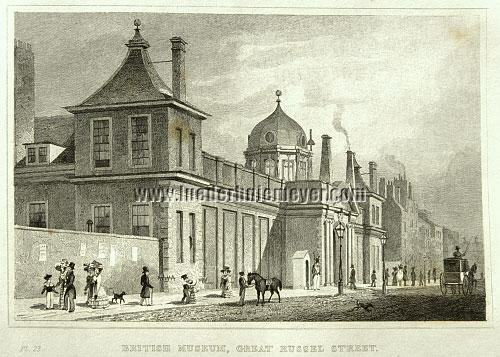 London – British Museum, Great Russel Street. With coach, gentleman with horse, and strollers on the sidewalk. Next to the entrance sentry-box with guard. Steel engraving by W. Henshall after Thomas Hosmer Shepherd (landscapist, architectural draughtsman, and aquarellist, 1793-1864). (1830.) Inscribed as above. 4⅛ × 5¾ in (10.4 × 14.6 cm). – On the back two foxspots virtually not perceptible in the subject as well as two further ones in the white upper and right lateral margin resp.